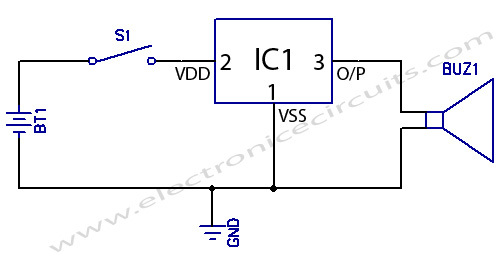 This simple alarm generator electronics circuit utilizes a UM66TXXL TO92 package CMOS IC that generates song depending on the type of IC used. 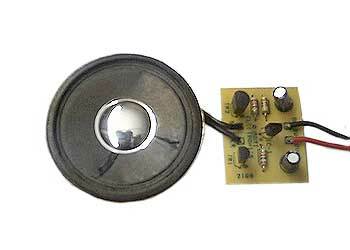 It has a built in oscillation circuit and need only a few external components to make it work. It is powered by a power supply range from 1.5V to 4.5 V DC with low power consumption, hence a longer battery lifetime. Once it power on reset, the melody will begin to sound. The part number for different songs are as listed below. 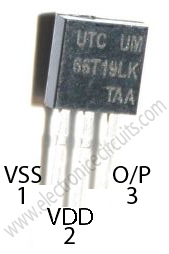 The IC can be used to drive a buzzer directly or driving a speaker though the use of a transistor.